Good evening Fellow Rotarians and guests, please allow me to recognize all of the protocols that have already been established. In addition, I would also like recognize the presence of my beautiful wife Barbara and our two children Eriecia and Eric Jr. I also promise you, that I will not bore you tonight with a long drawn out speech. I am sure that you would all agree, that it has been a wonderful night of fellowship so far, as we mark the beginning of the new rotary year, with this our annual handover ceremony. First of all, I would like to thank you my fellow Rotarians for selecting me to lead our club as President for the next Rotary year. As I stand here before you tonight, I am indeed honored to be given the opportunity to serve in this capacity. And you have my sincere assurance that I will be dedicated to the cause of Rotary in this role, the same way I have demonstrated my commitment over the past few years since I was first induction into the club. So… how did I get here? I can recall the genesis of this journey just like yesterday. It was a typical Antigua day sometime in mid-2011, hot, sunny and dry. I was walking on Newgate Street close to the Corn Alley junction when I ran into Past President Cordell Josiah. As I had not seen him in a while, we had a bit of catch up talk. Prior to that sometime ago, we had a common set of friends and socialized occasionally. However during the conversation, out of the blue he said, you know something, I think you would make a very good Rotarian and I would like invite you to one of our fellowship meetings, which of course he explained to me, are held every Wednesday at midday. At that time I was Head of the Engineering Department at Cable and Wireless in Antigua and North Eastern Caribbean. And in the context of my work life, the only thing that my former boss Davidson Charles (The then C&W GM) had me think about, is a certain company dressed in red that our incoming secretary works for,… whom he said was here to eat Cable and Wireless’ lunch. And of course, in the Mobile Communications business, the person who runs the network is the person that gets all the blame when customers move over to the competition. While I always had the urge to get involved in a service club so that I could give back in some way,…. because of all that was carrying on at work at that time I felt that I simply would not have the time to commit to such a cause and do it well. As fate would have it though, sometime in 2012, the company took a position that all of its senior managers should be involved in at least one service club in Antigua, and a list of such entities were presented. Immediately I remembered my conversation with PP Cordell and indicated there and then that the Rotary Club of Antigua would be my first preference. I immediately contacted PP Cordell, and started attended meetings soon after as a guest for a period. I was formally inducted into the club in May of 2013 and the rest of course is history. 4. What does it mean to be a Rotarian? So… what is my view on what it means to be a Rotarian? At the recently held Rotary District Conference that I attended in Trinidad, the RI President’s representative (RIPR) at the event, Michael Colosurdo Sr. spoke on the topic “In Search of the Meaning of Rotary Service”. I found the content of his presentation to be extremely motivating and inspiring which this brought me back to that day when I was inducted in to this club. 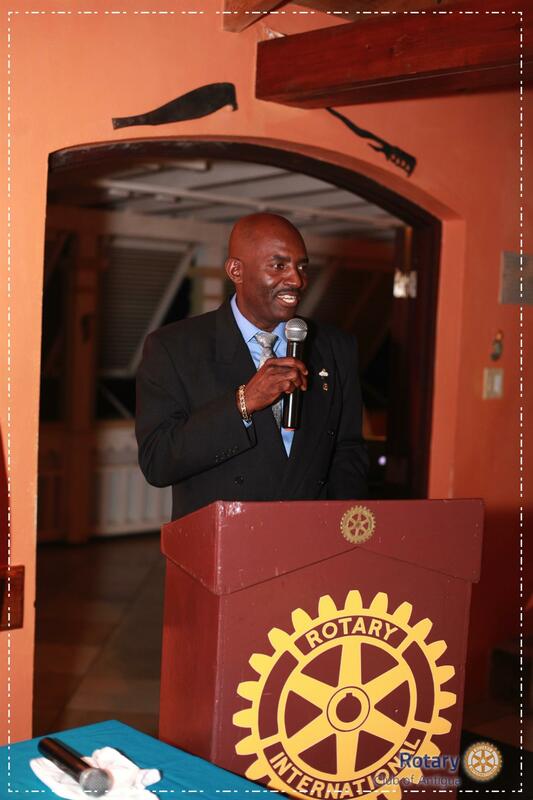 Of course, by that time, I had decided that it was time for me to give back, and was pleased that the Rotary Club of Antigua was the entity through which I would deliver service to our community. One of the fundamental questions that every person should ask him/herself is: ‘What is the purpose of my existence'. I don’t want to be utopic about this, but in my view, the purpose of the life of every human being, should be, to make a positive contribution to the continuance and wellbeing of humanity. I therefore do not think, that it is good enough, for someone to be in a position to be able to give of his/her time, effort and or resources to help others, who are less fortunate in our society, and does nothing. So, here is where we as Rotarians differ and that’s why we are here… to make a difference. One of the key strengths of Rotary that we will continue to leverage as we deliver service to our community, is the diversity in skillsets and vocation across our members, many of whom are successful business leaders and professionals. As RIPR Colosurdo shared at the conference, and as we know of course, the great opportunities of Rotary service reaches beyond what can be achieved through individual pursuits and by contrast, the impact can outlive us for generations to come, and in the process defines us as Rotarians. In other words, his view on the matter is that “Rotary’s Service to Humanity “should NOT be DEFINED not only BY WHAT WE DO but more importantly by WHO WE ARE!! Also Rotary should not about the District Governor, the AG, nor is it about the Club President, but rather it is About us as individual Rotarians…. it is about our personal contributions that we make to those in need in our communities that Rotary serve. With respect to the first priority (Support and strengthen Clubs) the incoming RI President, Ian Riseley,….raised a very important concern in his address to the Rotary International convention in Atlanta last month. He stated that in general, when the specific challenges in most Rotary clubs are examined, there are two that stand out most of all. One is the gender balance in our membership, and the other is the average age of Rotarians. Today, only 5 percent of RI’s reported membership is under the age of 40, with the great majority of members over 60 years old. As it relates to the Rotary Club of Antigua however, statistically we are looking a bit better with 11 percent of our members less than 40. But nonetheless, it emphasizes the need for us to find new and better ways to consistently attract and engage younger members. This is something that we have to achieve, and is obviously essential for our organization to flourish. In our effort to increase our humanitarian service as our second priority, the most important element that cuts across all six areas of focus is sustainability. As such, we have to ensure that this key element is embedded in all of the projects that we execute this year. In his address, Mr. Riseley also made the case that environment protection and curbing climate change are essential to Rotary’s goal of sustainable service. In that regard, he has challenged every Rotary club to make a difference by planting a tree for each of its members between the start of the Rotary year, July 1st 2017 and Earth Day, April 22nd 2018.” I am sure that all of the members of the Rotary Club of Antigua, are in full alignment with that view, hence this is one of the projects that I will be proposing for us to execute during this year. One of the other key points that came out at the district conference from both the outgoing and incoming district governors, is the need for the on-island clubs to work together more closely. In this regard, we will be making a greater effort to collaborate with our sister club Rotary Club of Antigua Sundown on at least one or two projects this year. As we look at our plans for this year, the following is a list some of projects that we have identified. Fellow Rotarians and Guests, I am keeping my promise that I will not be long, so in closing I would like to make mention of a famous quote by Winston Churchill who said “We make a living by what we get, but we make a life by what we give”. Of course, today we exist in a society where much emphasis is placed on personal wealth accumulation. However, we must always remember the less fortunate among us, and the fact that life in abundance, comes as a result of giving ourselves to others. This is who we are as Rotarians...we know that the more we give of ourselves, the more we are likely to receive, so that we can continue to make a difference in the lives of others. Fellow Rotarians: As we have been doing for so many years, this is what we will seek to achieve together through the programs that I have just outlined. And remember, our theme for this year is Rotary: Making a Difference.